Obviously I've been reading anything and everything about Kim's wedding. It's not like I'm yearning to be married (and to whom is the real question here), but as my mom so eloquently put it yesterday, "Well, bless her heart. She's been dying to get married for awhile now." AND HOW Mom, and how. 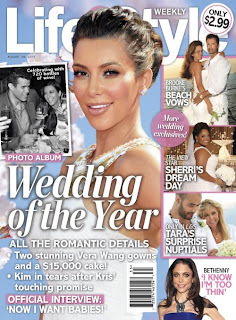 Kim wore a wedding dress by Vera Wang and then changed into two additional outfits. I'm sorry, but I don't want to worry about "costume changes" at my own wedding. My ideal situation (in case you care) would be that my wedding dress converted into a short, sassier number for the reception. Then again, if Vera Wang was offering to make me two additional dresses, I'm not going to tell the woman no. I mean, Vera's whole life is dedicated to making wedding dresses. Why should I deny her passion? After all, wearing a VW gown is the dream of both mother and late grandmother, so let's hope I'm pulling in the dough by then. Kim's wedding: $10 million dollars? The first estimate was $30 mil. At first this sounds absurd. Who would spend that kind of money? Well, if you're filthy rich and famous, you're not paying for crap. That's right. Kim probably bought her dresses and both rings were paid for, but I'm sure the venue was loaned, and some companies would take press over payment since it's such an extravagantly publicized wedding. Famous is the keyword here, however. You can be rich, but you're not going to make money off your own wedding if you're not famous. UPDATE: According to Perez Hilton, all three Vera Wang gowns were given to Kim and the engagement ring ($2 mil) plus both wedding bands ($1 mil each) were both "deeply discounted." The wedding invites were free, and pretty much after selling the wedding and engagement photos, they definitely profited from the wedding. Which leads me to Carrie Underwood. 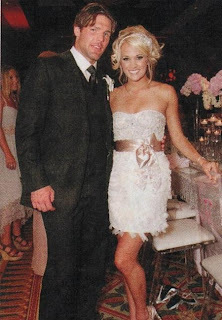 She and Mike Fisher had their wedding in Georgia at the Ritz Carlton -- Reynolds Plantation, and not only did Carrie don a hefty rock on her ring finger, but the couple rented out more than 250 rooms at the hotel for the occasion. I'm pretty sure that's the entire hotel. The bill? $500,000. Holy crap. The thing is, I'm pretty sure Carrie sold her photos to People for around $1 mil. So, she could have broke even, or she even could have MADE money off her own wedding! How absurd is that? What's more absurd is that I feel like this is something not out of the ordinary, and further, that I'm capable of achieving this peak of matrimony myself. Really. I refused to get married until I am financially sound, can make money off my own wedding, or both. And yeah, I should probably find a man that will deal with this kind of unrealistic thinking and loves me regardless. Is that disturbing? No my friends, it's just smart.